The Pacific Pride Commercial Fueling System is a fast-growing nationwide network of 24-hour fully automated fueling stations dedicated exclusively to commercial customers, and offering unsurpassed convenience and cost-accountability from a single, reliable source of credit and billing. As a Pacific Pride "Frequent Fueler", you will be issued special access cards encoded with billing and security numbers for every authorized driver or vehicle in your company. It works like an automated bank teller card; when the card is inserted the driver enters purchase information, which is automatically entered into our system. Pacific Pride helps you gain control over the buying practices of your drivers. There are no lost receipts or unauthorized purchases to worry about. We issue a comprehensive statement to your company that simplifies bookkeeping and improves your control. PRIDE Makes The DIFFERENCE. Discover what convenience and closely managed purchasing can do to improve the cost efficiency of your fueling. Take control with The Pacific Pride Commercial Fueling System. 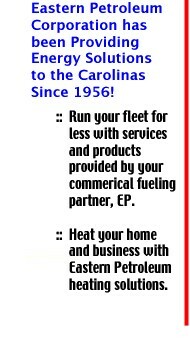 Call Eastern Petroleum Corporation at (252) 445-5131 or fill out our information request form.